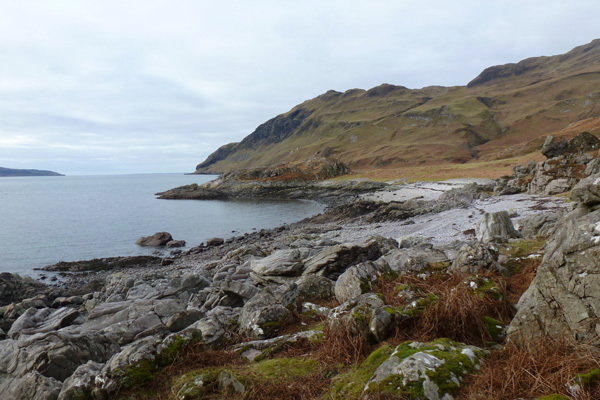 An interesting walk along the rocky shore line from the inlet at Camus nan Geall on the Ardnamurchan peninsula. The fertile ground on Camus nan Geall has a long history of settlement as evidenced by an ancient chambered cairn and standing stone. 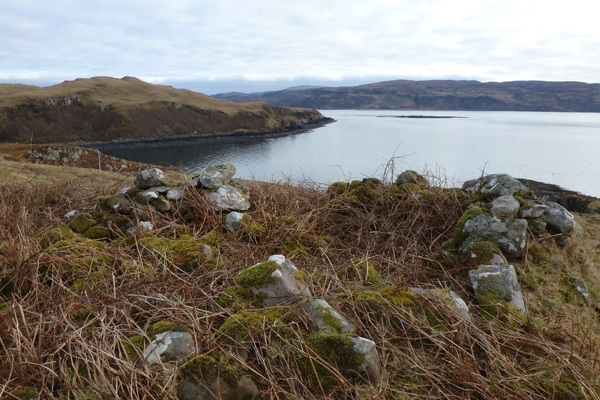 The site has also served as a burial ground for Campbells of Ardslignish as evidenced by some carved gravestones. 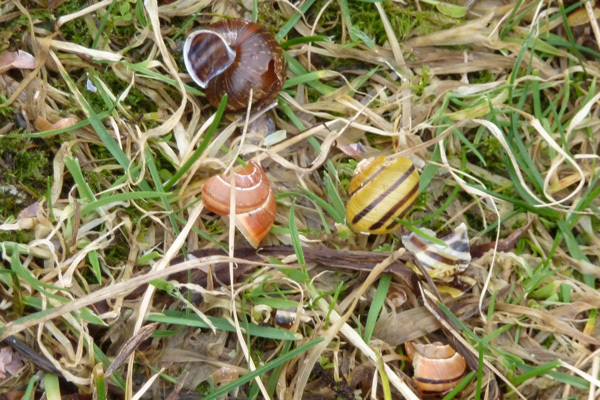 The walk is mainly across rough pasture, wet meadow, heath and shingle bays. Look out for flag iris, water parsley and devils bit scabious on route and interesting coastal flora. The rocks and boulders support colourful assemblages of crustiose lichens forming complex mosaics and patchworks. 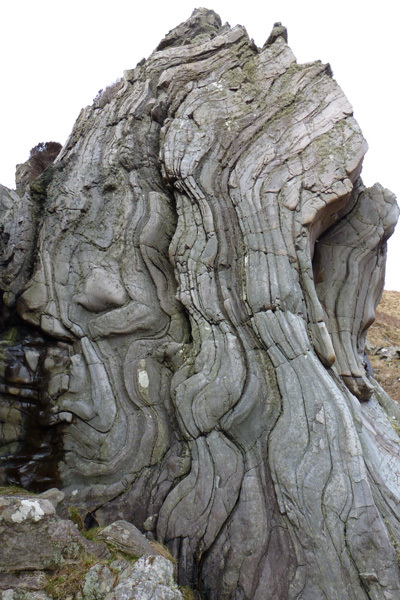 There are also some interesting geological formations including some heavy folded and contorted Moinian metamorphic rocks on route. 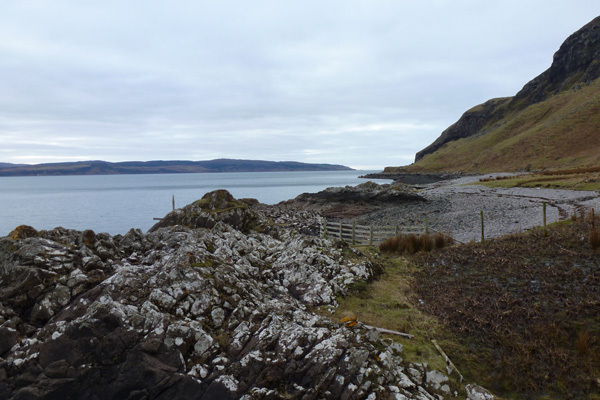 The bedrock is granofelsic psamite (Morar Group); a metamorphic rock formed 545 to 1000 million years ago, with some Palaeogene micro-gabbro and basaltic dyke intrusions. 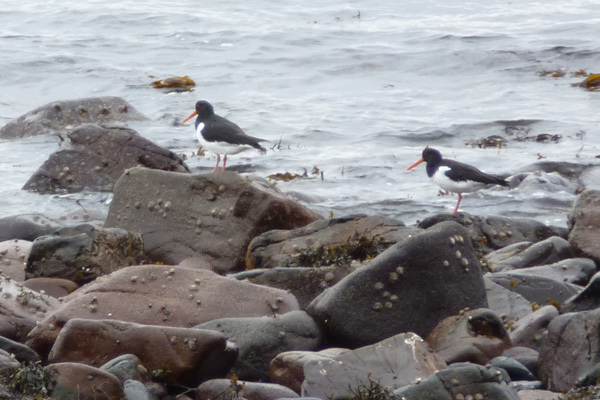 Look out for otters, cormorants and shags, white-tailed eagle and waders along the coast; pipits, ravens and golden eagle across heath and hills. 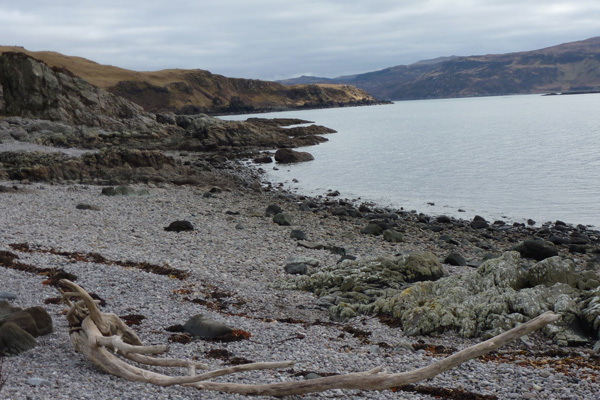 The shoreline, with its numerous rocky promontories, is also particularly interesting at low tide with a good zonation of brown seaweeds and kelp forests. A good place for a seashore safari. The path is reasonable distinct, but there are some sections where you need to scramble over rocks and walk across shingle beaches. The route can also be very muddy and indistinct in places and there are a couple of small stream crossings. 1. 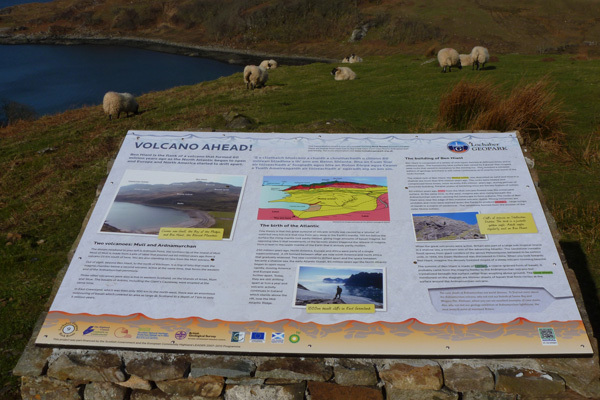 Park at the view point on the B8007, where there is an interesting interpretation board showing the key geological and landmark features associated with the Ben Hiant Intrusion. Head down the track through a fertile field towards the bay passing through a couple of kissing gates and onto the shore; taking care at the last gate as it may be very muddy. The track is lined with some fine specimen sycamore trees and there is evidence of an early agricultural settlement, in the form of the remains of an ancient chambered cairn. Only part of the chamber and forecourt have survived, but there is also a standing stone about 90 metres south by the ruins of an old chapel. 2. Once on the shingle beach, turn right and follow the foreshore, crossing a small stream and then over shingle and small boulders to the small headland. The shingle and small boulders make for slow progress, but once over the headland the path is relatively easy to make out and follow. 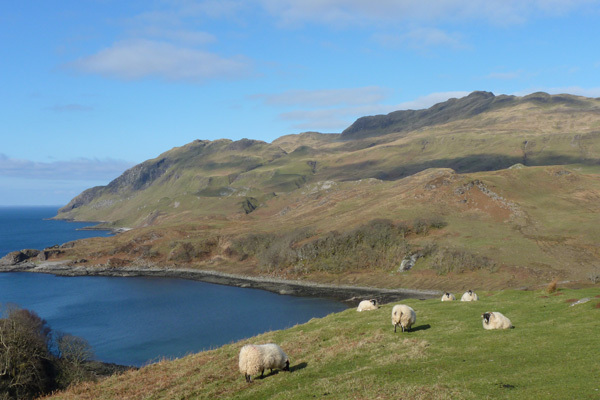 The route winds along the coast with some stretches inland across rough pasture, wet meadow, as well as across several impressive small shingle bays beneath the inspiring backdrop of the Ardnamurchan hills. There is a particular interesting geological formations along a narrow ravine which you pass through after the first headland. The path can be very boggy in places. There are some scrambles over large boulders and the shingle beach crossings. 4. Return by the same route, take time to visit the remains of an old fort on the small headland immediately west of Camus nan Geall on your return. 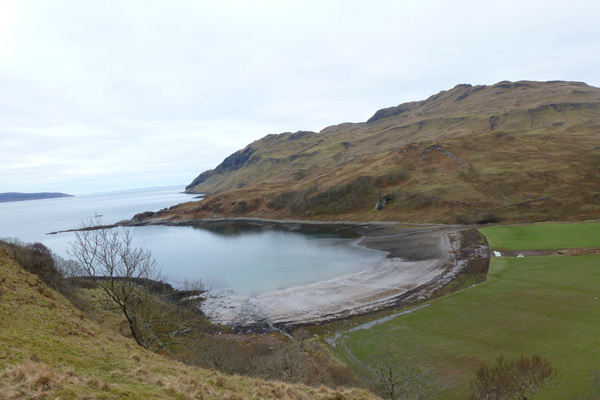 This walk offers lovely views of the Ardnamurchn coastline, but is not one for the quality of the walking experience.